It’s an annual tradition. Literally. The Detroit Lions have played on Thanksgiving every year since 1945. When it comes to Thanksgiving football, it’s utterly difficult to imagine not seeing the Lions on television as you enjoy a meal with family and friends. The 2016 edition of Detroit Thanksgiving football sets up as a key divisional matchup in which the winner takes sole possession of first place in the NFC North. To see the Minnesota Vikings (6-4) at this point of the season still winning games while dealing with an incredible amount of injuries is amazing in it’s own right. Seeing the Detroit Lions (6-4) in this position is a surprise to many. So who will celebrate the holiday sitting on top of the division? Here is the breakdown of the 12:30 PM EST contest between two divisional rivals. If the Vikings somehow find a way to the playoffs, the case for Mike Zimmer as Coach of the Year is incredibly strong. A team that lost their starting quarterback in Teddy Bridgewater to a devastating knee injury and trading for current starter Sam Bradford about a week before the season was just the tip of the iceberg as far as altering circumstances for the Vikings this season. After a 5-0 start to the season, the Vikes are 1-4 in their last five with the one win coming over the Arizona Cardinals last week. The offense for the Vikes has not been pretty to look at over the course of the season, ranking 32nd overall and 32nd in rushing offense. For the most part, Bradford (2,191 yds, 12 TDs, 2 INTs) has been reliable and has only one game under 62% completion percentage. He will be without his best receiver in Stefon Diggs, who leads the team in catches (67) and yards (747) with two TDs, due to a knee injury ironically. That absence means the offense will rely a little more on tight end Kyle Rudolph (39/404/4) and receiver Adam Thielen (37/518/3). 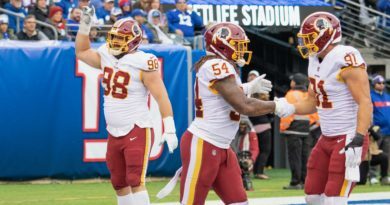 The offensive line has also seen a revolving door of bodies and are now on their third starting left tackle of the season with Jeremiah Sirles. There is no argument that the Vikings have one of the best defenses in the entire NFL. Within that rock solid defense is a linebacking duo that is maybe a season away from possibly being considered the best. Starting middle linebacker Eric Kendricks and strong side linebacker Anthony Barr are two athletic ballplayers that lead a defense that is stout at every level. The defense is third overall and second in turnovers while also giving up the second least amount of points per game. Defensive ends Everson Griffen, Brian Robison, and Danielle Hunter provide a productive trio of pass rushers and the three have combined for 18 sacks on the season. Cornerback Xavier Rhodes has allowed only one TD on the season, coincidentally it was against the Lions in week nine which was also the game-winner in overtime. Coming into the season, there were low expectations surrounding the Lions and now they find themselves clear in the playoff picture. So far, Quarterback Matthew Stafford has a QB rating of 101.2 with 18 TDs and only five INTs. Detroit is 5-1 in their last six games as Stafford has 11 TD passes with one INT in that same span. It’s no coincidence that the Lions success in recent weeks corresponds with his excellent play. The run game for the Lions leaves a lot to be desired and they have not totaled over 100 rushing yards since week two. So instead, Stafford leans on his deep arsenal in a passing game that has 33 plays of 20 yards or more, 12th in the NFL. 36-year old receiver Anquan Boldin leads the team in receiving TDs with five along with his 41 catches, while the duo in Golden Tate and Marvin Jones have 90 catches and six TDs together. Tight end Eric Ebron is benefitting from the garnered attention from the rest of the receiving corps and in four of his last five games, the UNC product posted at least 69 receiving yards. The Lions defense isn’t spectacular by any means but when it comes to needing a key stop or making plays late in the game, they have done just that at times. 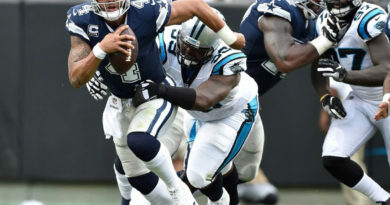 I’m positive no one expected defensive end Ziggy Ansah to be sack-less at this point of the season but that is definitely the case at the moment. Look no further than backup defensive end Kerry Hyder to lead the team in the sack department with seven. It helps to have one of the best young corners in the game in Darius Slay (25 tackles, one INT, nine pass breakups) and the fourth-year corner has only allowed 54% of his passes. The week nine contest between the two teams was a defensive slugfest for majority of the game until it ‘flipped’ in Detroit’s favor with a 28-yard touchdown reception by Tate in overtime. There is no standout quality about the Lions at all. They just win by finding ways and taking advantage of teams that fail to put them away. The Lions have six comebacks in the fourth quarter or later this season which clearly shows the team has a knack of winning off resilience. The run game for both teams is about as non-existent as the element can be but one advantage in favor of the Lions is having the services of the versatile Theo Riddick who has 43 catches and four TD receptions on the season. He is the lead back in Motown at the moment and pretty much the only reliable weapon in the backfield for the Lions. A top five defense in the Vikings will keep this a close, four quarter game that won’t produce a ton of yards or points. In their home win last week, the Vikings benefited off a 100-yard INT return for TD by Rhodes and 104-yard kickoff return for TD by receiver Cordarrelle Patterson. In order for the Vikes to get a win on Thanksgiving, those type of plays will be needed again. 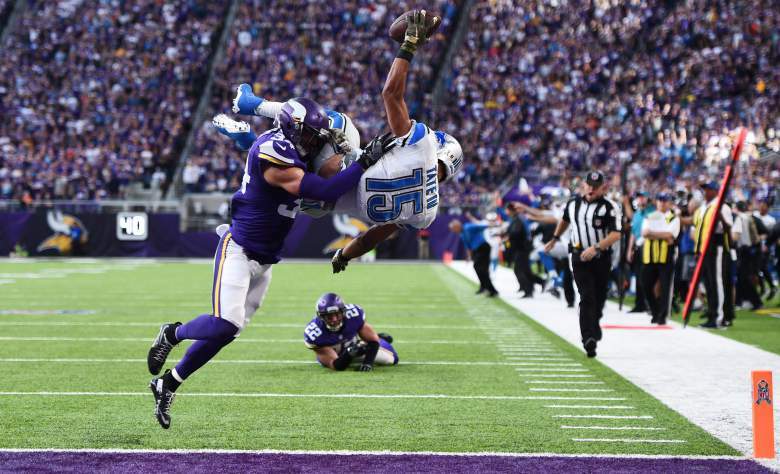 Without Diggs, Minnesota’s offense becomes even more stagnant which means they may be unable to put away a Lions team that does just enough to stay alive and extend their Thanksgiving win streak to four.